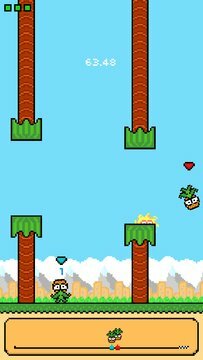 Enjoy Real-Time Online Multiplayer with Pineflapple! Flap your way through an endless adventure with 5 different fruity characters. Engage yourself in online multiplayer gameplay and race against your friends and opponents from all over the world. Keep track of your stats including your total game count, win count, win streak, score, and your global ranking. Race, win, and shoot to the top of our global leaderboard! Pineflapple does not use a username/password system to log in to the Pineflapple servers. 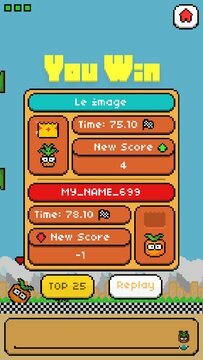 A random name and id is generated for you when you first run the game. If you delete the game off of your device your multiplayer data will be lost. Please e-mail support if a situation like this occurs. The Pineflapple servers do NOT collect any sensitive information.